Handheld shower heads are multi-functional. They conserve water and energy without sacrificing water pressure. They also provide refreshing showers and soothing massages as well as help make washing hair and cleaning kids, dogs, bathtubs, and showers less tedious! Even if you have water pressure issues, there is a best handheld shower head for low water pressure areas! Handheld showerhead has an adequately long flexible hose, easy grip, and good pressure! 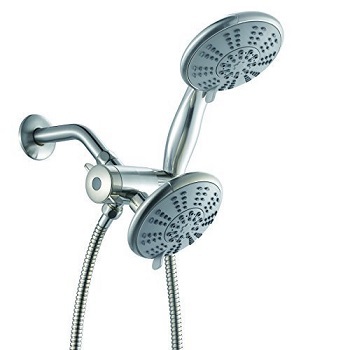 Handheld showerheads may be mounted high and used as standard hands-free showers. Or they may be mounted next to a stationary shower head and used as an auxiliary handheld device. Some high-end handheld shower heads have multiple heads and spray features. The best handheld shower head is affordable, easy to install, and easy to hold and manipulate. They have enough spray features to make showering enjoyable as well as practical. They are also well made, durable, and have amenities such as anti-clog nozzles, extra large sprays, and water/energy-saving features. The Ana Bath anti-clog, dual handheld / stationary shower head combination upgrade allows you to create a private spa in your own home! This 5-function, high-pressure, water-saving shower system is a traditional style, dual shower head combination with large 5-in. wide-spray faces. Its large, three-way diverter is wider and longer than what is required by industry standards. It also offers you an easy-grip ergonomic handle for shower control. 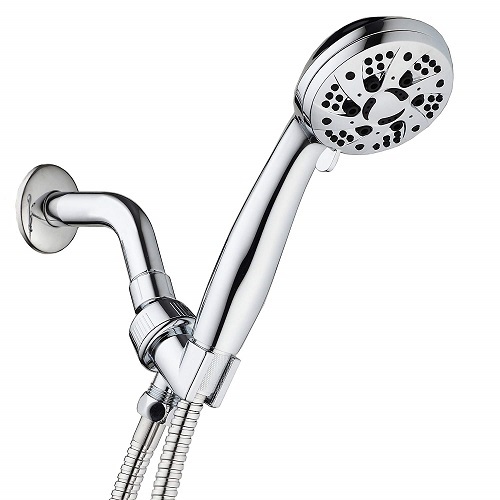 The handheld shower head and stationary shower head may be used separately or together. Each shower head sprays approx. 2.3 to 2.35 GPM at 80psi, which meets the CSA Standard for water pressure. Its multi-function settings (Rain Spray, Massage Spray, Rain/Massage Spray, Bubbling Spray, and Rain/Bubbling Spray) provide water-saving control technology for longer, relaxing showers without impacting your water bill! 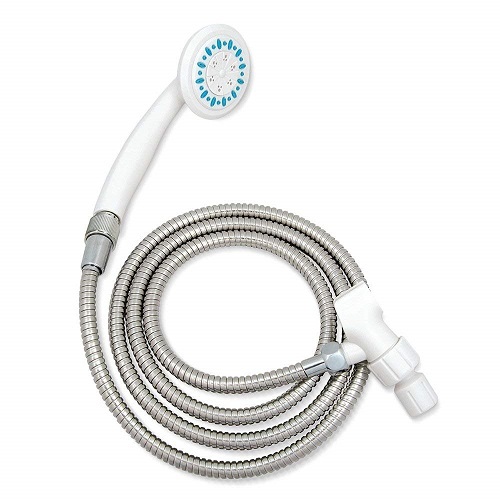 Other Ana Beth large-spray combo handheld/stationary shower head system features include lime/mineral resistant anti-clog nozzles and a 5-foot (60”) super-flexible stainless steel hose with durable anti-twist ABS/brass mounts. The 3-way diverter is mounted with a brass connector. The handheld shower is ABS and all parts are electroplated with a brushed nickel finish. An installation manual, 3-yr. limited warranty, all-brass connectors, water-restrictor, and anti-leakage sealant tape are included. Delta Faucet’s Touch Clean handheld shower head is a versatile, anti-clog, affordable handheld shower massage upgrade that allows you to enjoy massage luxury in the privacy of your own home! This seven-function, high-pressure, water-saving shower head is a contemporary style with a hands-free mount. It also features an ergonomic handle for greater spray control and direction. The Touch Clean handheld shower head sprays approx. 2.5 GPM at 80psi, which is within the CSA (water pressure) Standards. Its seven multi-function spray settings (Soft Rain, Full Body, Drenching, Soft Drench/Full Body, Massage, Full Body/Massage, and Pause) provide water-saving control for more relaxing massages and longer showers. The water-saving Pause setting allows you to conserve water while soaping, shampooing, shaving, etc. Be assured the water temperature will not change when you restart the spray after Pausing. Other Touch Clean handheld shower head features include a soft rubber, lime- and mineral-resistant, easy wipe-clean, anti-clog nozzle and a 6-foot (72”) flexible tangle-free stainless steel hose with a vacuum breaker that protects your main water source. Its internal waterway ensures maximum performance, durability, and many luxury massage showers. An easy-to-follow installation manual, flow-restrictor, and a 15-yr. limited warranty is included. Hydroluxe full-chrome Hydroluxe® 5-setting, 24-function, 3-way shower head is a dual, handheld / stationary shower head combination. Its many features, specifications, and performance make it one of the leading handheld luxury shower heads on the market! It is an affordable, quality, high-pressure, water-saving shower system with two oversized 4-inch, wide-chrome spray faces. Its patented three-way water diverter is mounted with an anti-swivel lock nut. 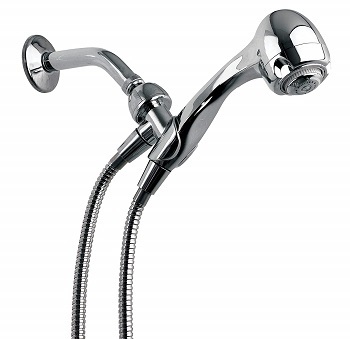 The handheld/stationary shower heads are chrome-finished ABS. The handheld shower head and stationary shower head may be used separately or together. Each shower head sprays approx. 2.5 GPM at 80psi, meeting the CSA Standard for water pressure. Each shower head also has 5 full-power settings (Massage, Power Rain, (Water-Saving) Economy Rain, Stay-Warm Mist, and Pause) that provide water-saving control for exceptional showering experiences. These settings may be used individually or in combination between the two shower heads giving you a total of 24 luxury washing, massage, and stimulating water flow patterns. This Hydroluxe® large-spray combo handheld/stationary shower head system has a 3-zone click-lever and an overhead adjustable-angle bracket. Rub-clean jets help keep the nozzles flowing free from lime and mineral buildup. A 5-foot (60”) super-flexible stainless steel hose with conical brass nuts is easily attached and tightened by hand without tools. An easy-to-use installation manual, flow-restrictor, plumbers tape, and Interlink Products International, Inc.10-yr. limited warranty is included. This warranty becomes void, however, if this product is not purchased from an authorized distributor. YOO.MEE’s handheld shower head is an affordable, BASIC 3-setting, high-pressure shower massage spray that powerfully adapts to low pressure environments. It offers you a powerful patented 2XP Turbo shower spray and pulse massage experience for soothing muscle relief even when your water pressure is low! This basic handheld shower is ABS construction with an attractive and durable, non-corrosive chrome-finish. The YOO.MEE handheld shower head sprays a (review-tested) 1.8 GPM at 48psi, which is automatically water-saving and within the CSA (water pressure) Standards. Its three spray settings (Power Shooting, Pulse Massage, and Power Shooting/Pulse Massage) provide spray control for more relaxing massages and longer showers. Other YOO.MEE handheld shower head features include easy-clean silicon rubber jet nozzles that help keep lime and mineral deposits from building up. A generously-long 6.5-foot (79”) super-flexible stainless steel hose with adjustable bracket and brass connection fittings is also included. An instruction manual and customer service card, water-restrictor, anti-leakage Teflon sealant tape, extra gaskets, and 1-yr. limited warranty is included. Niagara Conservation’s handheld shower head is a highly efficient, affordable, anti-clog, maintenance-free water conservation upgrade that allows you to enjoy massage luxury without wasting water or energy. It has a patented pressure compensator inside that regulates flow consistency. 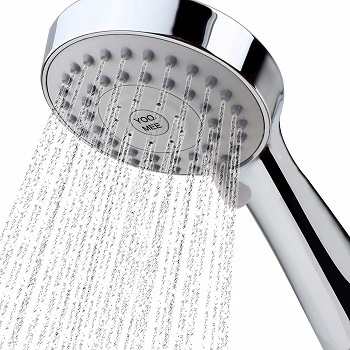 This shower head’s performance is not compromised regardless of your available water pressure. The Niagara handheld shower head maximizes energy savings while providing a consistent spray massage. It is an EPA Water Sense-approved unit. Its flow rate is approx. 2.0 GPM, which reduces water consumption by approximately 20% when compared to other comparable low-flow handheld shower heads on the market. This adjustable 9-jet turbo massage spray has adjustable settings ranging from high-pressure to soft spray. Due to the Niagara’s non-aerating spray, there is no noticeable temperature change or loss anytime during use. 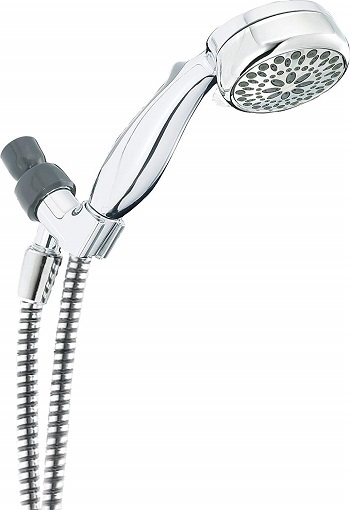 The Niagara handheld shower is ABS construction with a durable, non-corrosive chrome-finish. It features an anti-clog spray nozzle that is lime- and mineral-resistant and wipes clean to ensure consistent water pressure and flow. It has a 6-foot (72”) flexible tangle-free stainless steel hose with an adjustable (pivotal) bracket and a removable flow compensator that protects your main water source. Its internal waterway ensures maximum performance, durability, and many luxury massage showers. Niagara Conservation products include a 10-yr. warranty. The ShowerMaxx handheld shower head is a premium, innovative, 6-setting, high-pressure luxury spa design with a variety of features. This detachable handheld shower head has a removable flow restrictor and fitted sand filter disk. It provides optimal performance regardless of water pressure. 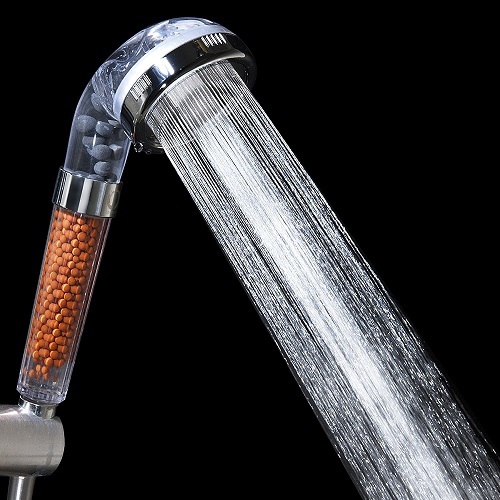 The handheld shower head is constructed from ABS. All parts, including jet nozzles and the large 4½” face plate, are finished in solid high-end, heat-resistant polished brass. These handheld shower heads are available in your choice of other color finishes. The handheld shower head effortlessly sprays approx. 2.5 GPM. It has 6 full-power spray settings (Rainfall, Power Massage, Rainfall/Power Massage, Circular Massage, Rainfall/Circular Massage, and Trickle) that provide water-saving control for exceptional showering experiences. The ShowerMaxx handheld shower head system has rub-clean silicon jet nozzles that help keep water flowing and free from lime and mineral buildup. The 4.92-foot (59”) super-flexible stainless steel hose stretches to 6.56 feet (78¾”). It has an adjustable brass-ball joint mount to help you get just the right spray angle. 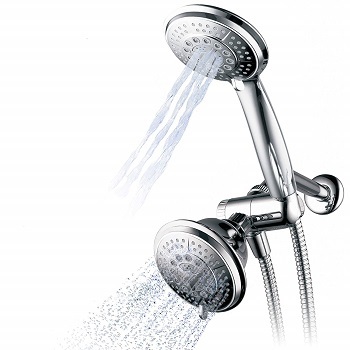 It is an affordable, high-pressure, water-saving luxury spa-grade all-inclusive shower head and installation kit. A step-by-step photo installation guide, flow-restrictor, rubber washers, leak-resistant Teflon plumbers tape, and a Peace of Mind Lifetime Warranty are included. The AquaSense handheld shower head is designed with safety and comfort in mind. It has 3 spray settings that are operated by an easy-turn dial on the handle that allows greater spray control. It also has an on/off switch at the base of the handle and an extra-long corrosion-resistant hose for increased bathing independence and sitting or standing comfort, and safety. The AquaSense handheld shower head has 3 adjustable spray settings (Standard, Wide, and Narrow) that provide greater water-saving control for easier showering experiences. The flow restrictor may be removed to increase water pressure and/or flow. The AquaSense handheld shower head is constructed from lightweight ABS. No tools are required to install the handheld shower head unit. The extra-long 6.55-foot (80”) tangle-free stainless steel hose conveniently allows you to sit or stand. A shower hook is included for hanging convenience when not in use. An instruction manual and 2-yr. limited warranty is included. The AquaDance handheld shower head is a premium deluxe 6-setting, anti-clog, affordable handheld shower massage upgrade that allows you to enjoy massage luxury in the privacy of your own home! This water-saving unit has a 3½” high-pressure, chrome-face. It also features an ergonomic handle for greater spray control and direction. The AquaDance handheld shower head sprays approx. 2.5 GPM. It has six full-function spray settings (Power Rain, Power Mist, Rain Massage, Rain Mist, Pulsating Massage, and Pause) provide water-saving control for more relaxing massages and longer showers. The water-saving Pause setting allows you to conserve water while soaping, shampooing, shaving, etc. The water temperature will not change when you restart the spray after Pausing. This AquaDance handheld shower head system has a 3-zone click-lever dial for easy setting change and an overhead adjustable-angle bracket. Rub-clean jets help keep the nozzles flowing free from lime and mineral buildup. A reinforced 5-foot (60”) super-flexible stainless steel hose is easily attached with brass hose nuts that require no tools to tighten. A detailed easy-to-use installation manual, flow-restrictor, washers, and Teflon plumbers tape are included. AquaDance offers the best Hassle-Free Limited Lifetime Warranty. The ZenFresh detachable handheld shower head is a single fixed-spray, high-pressure, water-saving, negative ion mineralized purification shower system that offers you a luxury spa experience in your own home. ZenFresh’s laser perforated technology ensures that water is saved without compromising water pressure. This handheld shower head filters the body spray to reduce oils and rejuvenate your skin. This detachable handheld shower head sprays approx. 1.45 GPM, which is a significant water-saving benefit without compromising power. Its 3-stage natural filtration system has three layers of bioactive stones and mineralized spheres (beads) that significantly reduce water impurities, which help you restore balance in your oil glands. This handheld shower head is recommended for anyone having mineral-rich water. The ZenFresh handheld shower head does not require tools to install, but it is recommended to ensure all connections have been sufficiently tightened. ZenFresh is a family-owned and operated company. The associated health benefits of using this detachable handheld shower head include smoother skin, reduced oil, and increased cell viability. ZenFresh offers a 100% satisfaction guarantee. The Vida Alegría handheld shower head is a contemporary style, 5-setting, anti-clog, affordable handheld shower massage upgrade that allows you to enjoy relaxing massage anytime. The removable flow restrictor allows this shower head to perform well regardless of your available water pressure. The handheld shower head is constructed from chrome-finish ABS. This handheld shower head has five spray settings (Drenching Rain, Gentle Rinse, (full-rotating) Massage, Two Mix Modes, and Drizzle) provide water-saving control for more relaxing massages and longer showers. The water-saving pause mode allows you to conserve water while soaping, shampooing, shaving, etc. The Vida Alegría handheld shower head system has rub-clean silicon jet nozzles that help keep water flowing and free from lime and mineral buildup. The 5-foot (60”) flexible, tangle-free stainless steel hose stretches to 7 feet (84”). It has an adjustable brass-ball joint mount to help you get just the right spray angle. The proprietary-design tightening collar ensures the shower head remains in the mount without twisting or pivoting. A step-by-step installation manual, flow-restrictor, washers, and Teflon plumbers tape are included. Vida Alegría offers a 3-yr. Unconditional Warranty. The right handheld shower head for you is the one that best suits you, your body, and your individual needs. Some may want extra large spray heads and several different massage settings while others may need a light, easy-grip model with simple settings. Many handheld shower heads are priced under $60. Higher-end, multi-spray, custom handheld shower heads are more. In general, the product should be affordable, easy to install, provide satisfying pressure on any setting, and be easy to hold and operate. It should be well made and durable with a reasonable warranty and satisfaction guarantee. You can still have the convenience and enjoyment of a handheld shower head even if you have low water pressure issues. A failing pressure regulator, shut-off valve, or leaking water main may be to blame, or you may just live in an area where the water pressure is less. There are handheld shower heads that are specifically designed for low water pressure environments. Adjustable shower heads are not all traditionally round anymore! Handheld shower head head-shapes may be round, square (flat-paddle), cubed, vertical wand, or freeform wave-shaped. They may be a single spray head, stacked double spray, a vertical wand, or rain shower spray. Handheld shower heads are designed for safety. Their metal surfaces can be hard to grip with soapy hands. Some handles are specially designed for those that do not have a strong grip. Some models are rubber-gripped. Others have a textured handle for a slip-free grasp. 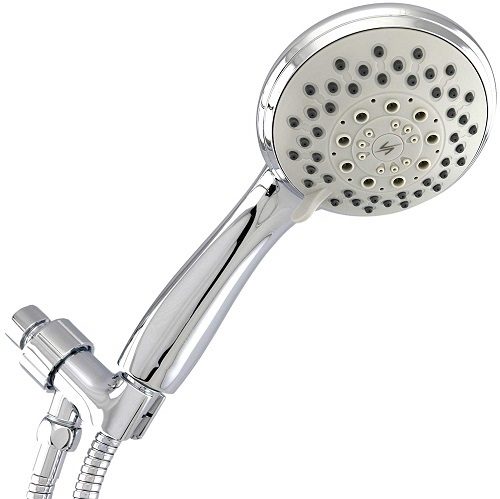 Ergonomic palm-style shower heads with C-shaped handles or straps do not require any grip. You simply slide your hand through the C-shaped handle opening and hold them like a spa shower. It gives you excellent control, allowing you to direct your spray and rinse more quickly. Each handheld shower head model has its buttons, switches, and settings that control the type of sprays and maximizes or reduces shower head water pressures according to your main water pressure. These controls may be lever-type switches that toggle, knobs, or buttons. These may be more difficult for some that have limited finger functions. Check the size and locations of these controls before you buy. The comfortable they are to use, the more enjoyable and effective your showering experience will be. Handheld shower heads come in the quality of materials, finishes, and color. They are typically made from a corrosion-resistant nickel for durability and longer wear. They are affordable and withstand temperature changes over a long period. 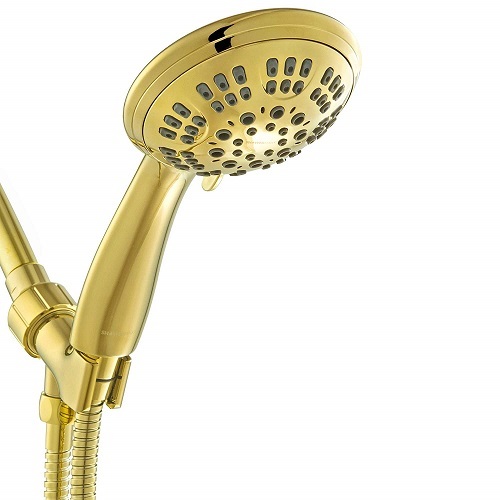 Handheld shower heads are commonly finished in hard, corrosion-resistant chrome or bronze. These shiny finishes are aesthetically pleasing and long-lasting with little maintenance. Their flex hoses are typically made of stainless steel. Typically, installing your new handheld shower head should not take long! A typical installation involves loosening and removing the old head, peeling off the deteriorated plumbers tape, wiping the threads clean, putting on new Teflon or plumbers tape, and attaching the new head. Threads should match and there should be no leaks when you test the new shower head. Of course, if you have a deluxe, multi-head model, or you find you have leaking pipes that need to be repaired, your installation will take longer. Installation guides are included with most products. The full-chrome Hydroluxe® 5-setting, 24-function, 3-way shower head ranks high. It is a luxury dual, handheld / stationary shower head combination that is affordable, high-pressure, water-saving shower system with two oversized 4-inch, wide-chrome spray faces. It has an easy click-lever adjustment, longer super-flex hose, and easy-care rub-clean jets. Reviewers report satisfaction with its quick and easy no-tools installation, the variety of settings/functions and overall performance, and warranty.